Take the boredom out of your room with these fun and functional décor ideas! Paint 7 pieces of wooden blocks or cardboard with chalkboard paint to represent each day of the week. With colorful chalk, write down reminders or draw cute characters to hang on your wall. Decorate a blank wall with your fave band posters or music icons and mix vintage and modern album artworks to create a unique look. Show off your passion for music or guitar playing by transforming an old guitar case into an accessory holder. 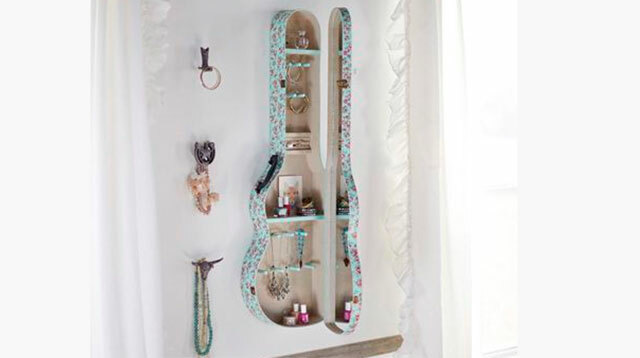 Add shelves and pretty wallpaper for a functional and chic case. Why not decorate your wall with silhouettes or stick on decals of some places you'd like to visit or have already visited? It would be a good sight to see every time you wake up. Frame an inspiring or fun quote on your vanity table to liven up your room. Try some unconventional shelving in your room, like these vintage suitcases for a girly touch or skateboards for a sportier vibe. Alternatively, you can stack suitcases to act as a cute and unique bedside table. Add a pretty tray on top to create a sturdy base for your trinkets and small knick knacks. Let your creativity flow with cork tiles. Mix big and small pieces on a wall and simply add what you feel, whether it is a certain color you like today, a line from a book, or a note from a friend. For more DIY decor ideas for your room, check out Candymag.com!